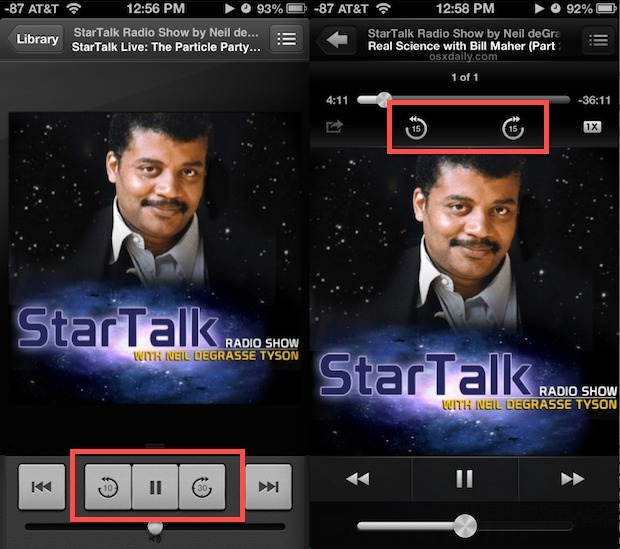 You can easily skip ahead and rewind in large blocks while listening to podcasts on the iPhone. This is a helpful feature of the Podcasts app in iOS for many reasons, perhaps you missed a section and want to rewind and hear it again, or maybe you want to skip ahead through an uninteresting segment. I use this podcast skipping trick frequently to listen to a sequence again, and to jump ahead through bumper music, commercials, or boring segments, and it works with just a tap in the podcasts app for iPhone. This feature is available in all versions of Podcasts in iOS. Go ahead and try it out, you’ll find this is excellent to skip through the repetitive intros of many podcasts that last far too long for no apparent reason (just get to it, we don’t need the same intro over and over again for 30 seconds!! ), and to skip through other sections or rewind to hear something again. Everything is the same whether you are on an iPhone, iPad, or iPod, and this works both in the Podcasts app and when playing podcasts through the Music app, though each app gives you slightly different options. In Podcasts app, you can jump back and rewind 10 seconds at a time, and skip ahead 30 seconds at a time. In Music app, you can both skip ahead and rewind in 15 second blocks. Why each app is different is unclear, but both apps also support the tap-and-hold fast forward and rewind option as well. pfff put something nice there i want to listen to a podcast of Kelly Divine. Are the jump back / jump forward buttons still available in March 2017? I don’t see them on the current music app. I’d really like to find an app with jump 5 or 10 or 15 seconds back or forward for listening to talk recordings like podcasts. Flicktunes was perfect until they quit supporting it about 2012 or so.